Dr. Infante, known as Talley to friends and family, died on Saturday, April 6, after a six-month illness. She was an associate professor and director of the Division of Dental Hygiene in the School of Dentistry at the UT Health Science Center San Antonio. 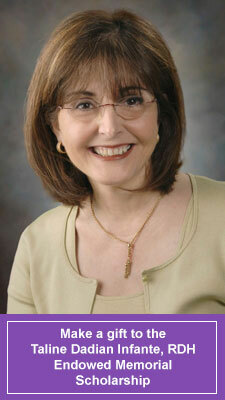 She was married to Anthony Infante, M.D., Ph.D., a professor of pediatrics at the UT Health Science Center. Her husband and family have established a memorial scholarship fund for dental hygiene students in her honor. Dr. Infante earned her bachelor’s degree in dental hygiene in 1978 from Loyola University and spent 11 years in private practice in the United States, Switzerland, France and South Africa. In 1991, she earned a master’s degree from Old Dominion University and entered the field of dental hygiene education. She earned her doctorate from Capella University in 2012. She joined the Department of Dental Hygiene in 1994, while it was in the School of Health Professions. She was promoted to associate professor in 2003 and program director in 2005. In 2011, she was named interim chair of the department. When the program was moved to the Dental School in 2012 she became director of the Division of Dental Hygiene. A champion for interprofessional education, Dr. Infante’s project, RESPECT (Realizing Enhanced Student Interprofessional Education through Clinical Teamwork), was a way for students from different health care disciplines to learn about each other’s roles and work together for the benefit of patients. In the project, four-person interprofessional teams of medical, dental, dental hygiene and nursing students engaged in team-building activities and worked together to design tailored, comprehensive, health-promotion plans for families living in the SAMM Transitional Living and Learning Center. Under Dr. Infante’s leadership, the Dental Hygiene program developed a national reputation for its professional development program for dental hygiene educators in the areas of clinical education and evaluation. In addition to providing timely and high-quality courses for dental hygiene professionals, the department also has become a regional leader in providing clinical courses for dental hygienists who are re-entering the profession and in certification programs for dental assistants. In addition to her husband, Dr. Infante is survived by her mother, Ankine Dadian of San Antonio; her children, Dominic R. Infante of Austin and Sabrina M. Infante of Portland, Ore.; sister and brother-in-law, Annie Dadian-Williams and Kenneth T. Williams, and their children, Zachariah F. Williams and Sage S. Williams, all of Bulverde. To make a contribution to the Taline Dadian Infante, Ed.D., RDH, Endowed Memorial Scholarship for dental hygiene students, please visit https://makelivesbetter.uthscsa.edu/infante or contact Patrick O’Hara, Senior Associate Vice President, at 210-567-2575.